Scott Milne, Republican candidate for governor, speaks to the Colchester-Milton Rotary Club. During the 45-minute appearance, Milne criticized Shumlin and Statehouse Democrats for pursuing what he called a “radical progressive agenda” that is straining taxpayers. Milne offered few specifics of his agenda. At various times, he told the 30 people in the crowd that he would release his own plans for health care, education and job creation in the coming weeks. He spent most of his speech outlining a governing philosophy as a deliberate moderate who would embody the “typical Vermont history of pondering things." He said former governor Jim Douglas and former U.S. senator Jim Jeffords would serve as his models. Milne said Shumlin is demanding more transparency from food conglomerates that use GMOs than he has offered taxpayers on how he would fund his goal of creating a universal health care system in 2017. Milne said he supported the goal of GMO labeling, but would have preferred for Vermont to have followed the lead of Maine, where lawmakers passed a labeling bill that takes effect only if five other states follow suit. 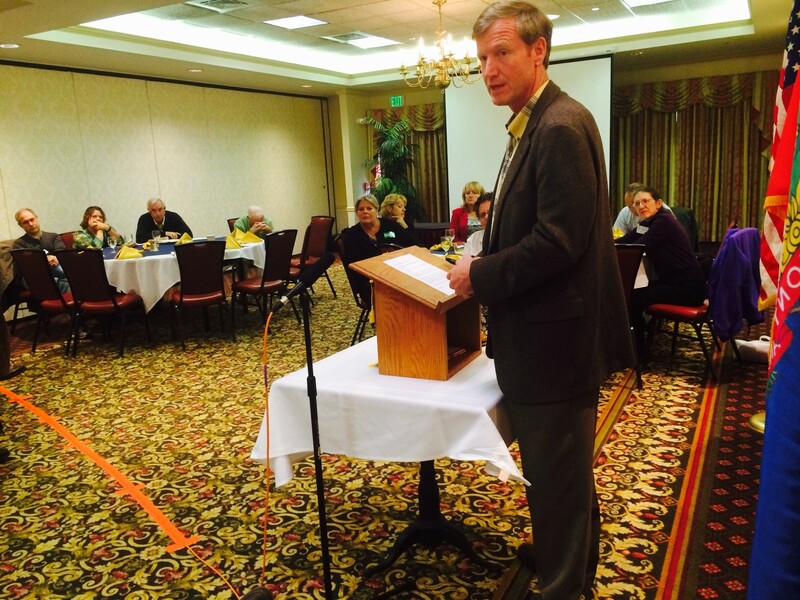 With seven weeks until Election Day, Milne said he was optimistic about his chances in his first bid for statewide office, though he told the crowd that as recently as six months ago that he had “no idea,” he would run for governor. A poll released in recent days showed him 11 percentage points behind Shumlin, closer than many forecasters had expected. During a question-and-answer session, Milne took a jab at Shumlin’s ambition, joking that Tuesday’s decision to take down the website was part of a ploy by Shumlin to lose the governor’s office so he would be free to begin campaigning for a U.S. Senate seat in the 2016 election. “He’s going to do a couple of other things to throw the election so I can deal with the problems and he can run for Senate,” Milne said.